This article was originally featured in the Feb. 4, 2008, issue of the Emory Report. On a clear May morning, farmer Sahlu Wolde woke as usual at 5 a.m., but instead of heading to his fields, grabbed his walking stick and began a four-hour hike to the health clinic nearest to his lowland farm in northern Ethiopia. By 9 a.m., the 60-year-old sat with other local farmers on the Gorgo Health Clinic's rustic wooden benches eagerly awaiting two lifesaving blue bed nets. 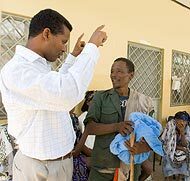 Ten years ago, he and his wife watched helplessly as their children, ages 3 and 5, died from malaria, one of the largest killers in Ethiopia. In most malaria endemic countries, young children are particularly vulnerable as their immune systems have not yet built resistance to infection, but in Ethiopia, where malaria is unstable, the disease does not discriminate, and both young and old are stricken. This year, Wolde's remaining family of seven suffered several bouts of the disease. "I heard this can protect my family from malaria," Wolde said after signing for his allotment of nets with his inked index finger. "I am very happy." He received the nets for free as part of a new Carter Center-assisted program. Building on an established network of community-based health care in Ethiopia helping to prevent and treat river blindness and trachoma, The Carter Center is combating malaria by distributing bed nets to many at-risk communities. Through the invitation of the Ethiopian Ministry of Health, purchased the balance of 3 million nets needed by the national program to protect all 50 million Ethiopians at risk of malaria, and the Center helped distribute the nets to families. The infected mosquitoes that transmit malaria bite only at night, which is why the protection provided by sleeping under an insecticidal net can be crucial in preventing the disease. Like most people living in the Amhara region, Wolde supports his family on his meager farming income and could not afford to purchase the bed nets sold in local markets at 60 birr each (roughly $8). The free Carter Center bed nets will protect Wolde, his wife, and their remaining children. Hung over sleeping areas and tucked under the mattress, the nets are made from fabric coated with insecticide that kills biting insects that land on it as they attempt to bite the sleeper below. These nets use the most current technological innovations in textile development; the insecticide is strongly bonded onto the fibers, and its controlled release properties will remain effective for the life of the net. Nets of the past contained insecticide coated weakly on to the surface and needed to be retreated annually. The new long-lasting nets promise a more sustainable solution to malaria control. 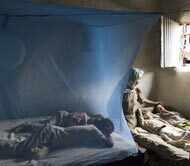 The Carter Center's commitment to Ethiopia's malaria program reaches beyond bed net distribution. At the government's request, the Center will continue to play a major role in this historic malaria control campaign by helping to evaluate the overall impact of the nets, distribution of drugs to malaria patients, and selective indoor residual spraying. The two nets that Wolde clutches under his arm as he treks back home represent new hope for his family and hundreds of others like him desperate to protect their children from a deadly disease. Dr. Estifanos Biru, the Carter Center's deputy country director (left), helps local health center staff educate Wolde how to hang his bed nets correctly to protect his family from malaria. Hung over sleeping areas and tucked under the mattress, bed nets are made from insecticidal fabric that kills biting insects that land on it as they attempt to bite the sleeper below.